One of the greatest satisfactions in making a charitable gift is the opportunity to honor your family or pay tribute to someone who has touched your life in a significant way. The Silver Leaf Stewards program is the perfect way to do this. Through your gift, you may honor a relative or commemorate your family name, or you may recognize a mentor or friend who has greatly shaped your life. 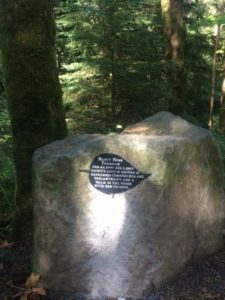 At the same time, your tax-deductible gift to Hoyt Arboretum Friends expresses your commitment to the future of Hoyt Arboretum and provides valuable support for a charitable purpose in which you or your loved one believes. 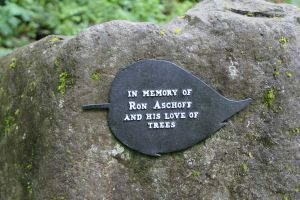 As a steward, an engraved metal leaf plaque will be installed on a rock wall in the arboretum and you will be listed as a member of the Silver Leaf Stewards program on our website and in recognition materials. 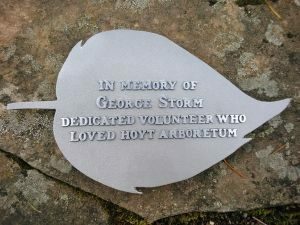 Become a Silver Leaf Steward and show your deep commitment to Hoyt Arboretum while you honor your loved ones and touch the lives of many others who enjoy Portland’s museum of living trees. Your gift supports the tree and plant collection fund and general operations. To learn more about becoming a Silver Leaf Steward, contact Anna Goldrich at 503.823.1648 or anna.goldrich@portlandoregon.gov. Gifts given in this range will receive a 7.5″ by 3.5″ metal leaf with the honoree’s name engraved on the leaf. These leaves will be installed on one of the multiple “hardscape” rock walls located throughout the arboretum. The leaf will remain on the wall for no less than five years, but may be removed after that time frame. Gifts given in this range will receive a 9″ by 5.25″ metal leaf with the honoree’s name and an inscription engraved on the leaf. These leaves will be installed on one of the multiple “hardscape” rock walls located throughout the arboretum. The leaf will remain on the wall for no less than 10 years, but may be removed after that time frame. Gifts given in this range will receive a permanent 9″ by 5.25″ metal leaf with the honoree’s name and an inscription engraved on the leaf. These leaves will be installed at a location deemed suitable by a.) the donor, b.) the executive director of Hoyt Arboretum Friends, and c.) a designee from Portland Parks & Recreation.